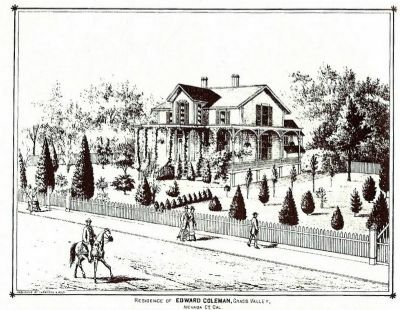 Edward Coleman built this house in 1866 and lived here, with his wife Luisa, until 1891. He was Pres/Supt of the Idaho Mine. Director of Nevada County Narrow Gauge Railroad and owned interests in the Mohawk Lumber Company. Location. 39° 13.094′ N, 121° 3.878′ W. Marker is in Grass Valley, California, in Nevada County. Marker is at the intersection of South Church Street and Neal Street, on the right when traveling east on South Church Street. Touch for map. The marker is located on the South Church Street side of the building which is located on the northwest corner of the intersection. Marker is at or near this postal address: 318 Neal Street, Grass Valley CA 95945, United States of America. Touch for directions. Other nearby markers. At least 8 other markers are within walking distance of this marker. Historic Emmanuel Episcopal Church (about 400 feet away, measured in a direct line); The Holbrooke Hotel (about 500 feet away); a different marker also named Holbrooke Hotel (about 500 feet away); Madison Lodge No. 23 F. & A.M. This side of the home faces South School Street. 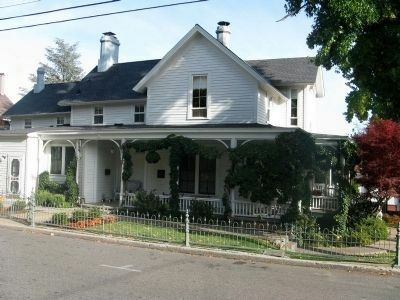 Robert M. Wyckoff writes in his 1984 publication of Walking Tours and Twice Told Tales of Grass Valley that the home was a Bed & Breakfast known as the Murphy's Inn. (about 500 feet away); Grass Valley Hardware (about 500 feet away); The Alpha Building (about 500 feet away); Grass Valley Library (about 600 feet away); Lola Montez 1819 - 1861 (about 600 feet away). Touch for a list and map of all markers in Grass Valley. 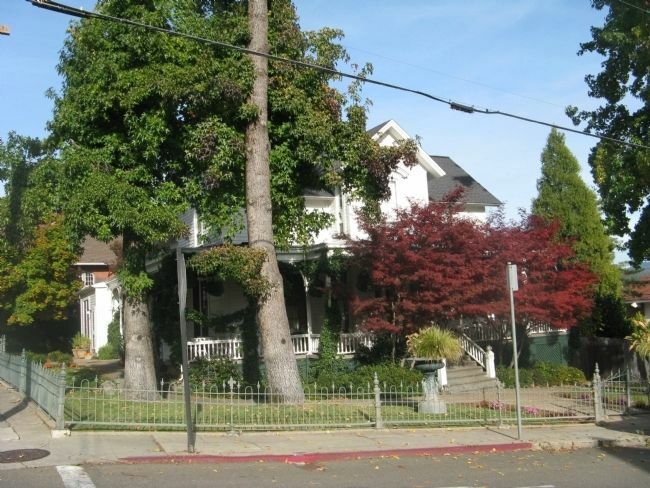 Coleman was involved in local mines and railroading, and built this lovely home in the 1860s. Home also owned by Joseph Weissbein, bank and mine owner, who was murdered at the Pittsburg Mine in 1915. The basic exterior has remained unchanged over the years. Now a private residence. The front of the home faces Neal Street. More. 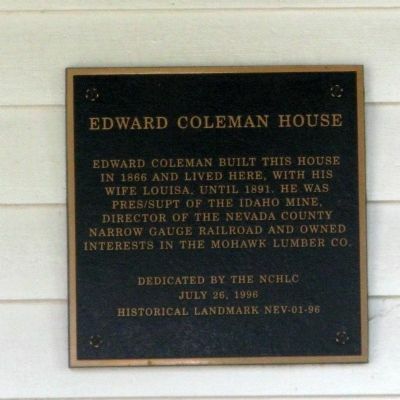 Search the internet for Edward Coleman House. Credits. This page was last revised on June 16, 2016. This page originally submitted on November 27, 2011, by Syd Whittle of El Dorado Hills, California. This page has been viewed 1,355 times since then and 28 times this year. Photos: 1, 2, 3, 4. submitted on November 27, 2011, by Syd Whittle of El Dorado Hills, California.